The creation of this college elevates the arts at the university and as a result arts majors will see their public performances, exhibitions and film screenings become more visible on our large and diverse campus,” Weast said. The college, which will open in July 2017, will include the School of Music, the Welch School of Art and Design, the film and theater component from the Department of Communication, the Center for Collaborative and International Arts and the Center for Educational Partnerships from the School of Music. These units are now part of the university’s College of Arts and Sciences. The university’s 2011 strategic plan outlined a plan to highlight the arts and media and called for the creation of a college of the arts. The college will bring together a group of faculty and students with common research and creative interests, goals and student learning outcomes. It will respond to the rapid growth of Georgia State and Atlanta, while capitalizing on recent growth in the film and entertainment industry in Georgia. Dr. Weast has been associate dean of music and fine arts in the College of Arts and Sciences and director of the School of Music at Georgia State since July 2015. Prior to coming to university, Dr. Weast was dean of the School of Music at the University of North Carolina School of the Arts (UNSCA) and director of the School of Music at the University of South Florida (USF). 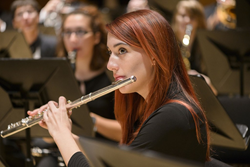 Weast was instrumental in developing partnerships among the arts departments at those institutions, and in the case of USF, formation of a new College of the Arts. His research and administrative interests include student-centered learning, peer learning and mentoring, and faculty development and evaluation. He has also been a successful fundraiser as evidenced by more than $3.7 million raised for scholarships at UNCSA. “I look forward to working with Dr. Weast to ensure the successful start of the College of The Arts and to making it one of the most outstanding arts colleges on an urban university campus in the nation,” said Provost Risa Palm.